Upon realising a couple of weeks ago that there was a full Non-League schedule on Bank Holiday Monday, meaning the opportunity to add a bonus match to my maiden groundhopping month, my wife swiftly informed me that we (by which I mean she) had already arranged to meet friends that day. Yet before my heart could sink too far into the pit of my stomach, she added to her potential bombshell. The friends we were going to be meeting were one of my long-term coaching colleagues from Brighton’s 5Ways Soccer School and his better half, who just so happens to work behind the bar at Worthing FC. That’s right. She had arranged a meeting with friends at a football match!! Major bonus points there for my almost better half (it’s alright she never reads this). And so it was that today’s groundhopping journey took me to Worthing FC’s Bibby Financial Services Stadium (formerly known as Woodside Stadium). Their opponents for the Bostik League Premier Division match were fellow West Sussex-based side Burgess Hill. 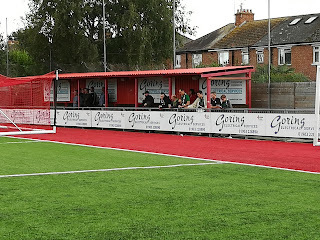 With Worthing one of Sussex’s better supported sides, and Burgess Hill located not at all far away, I realised that there was likely to be quite a big crowd for the game. 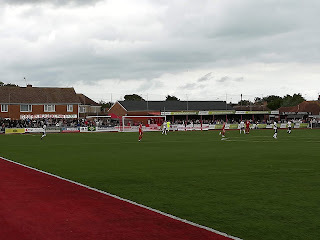 Therefore, setting off slightly earlier that I would normally have done for my trip along the A27 to Worthing, I ended up arriving at the stadium at about 14:15, having parked around a 5-minute walk away. Not too bad. 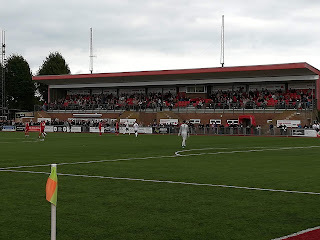 The cost of admission and program was the same it had been at East Grinstead on Saturday (£10 and £2 respectively) and the second I stepped through the turnstiles two things were instantly noticeable. Firstly, the crowd for the day was indeed going to be quite large (almost 1,200 as it turned out), and secondly this is a hugely impressive ground. 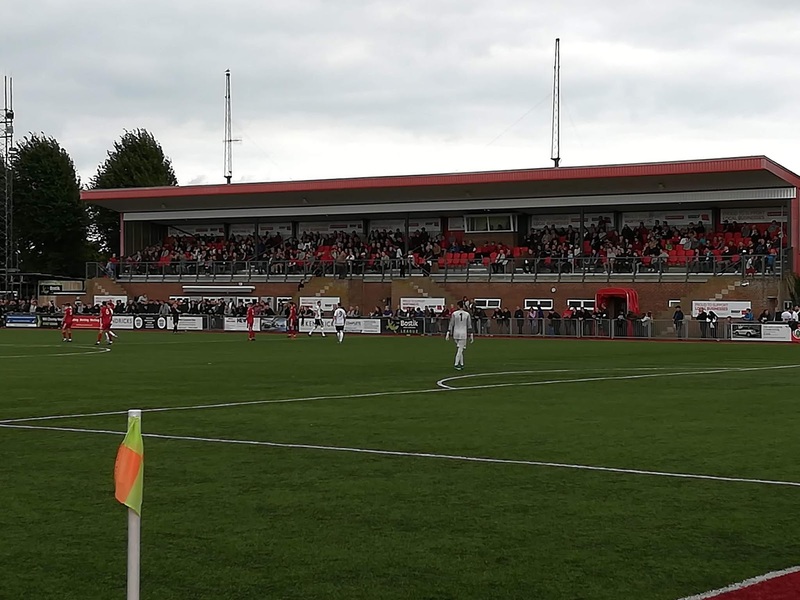 Woodside… sorry I mean the Bibby Financial Services Stadium… is dominated by a huge brick-built seated stand- under which sits the clubhouse and changing rooms. There’s also an outside bar and coffee hut, which is perfect for busy days like today. There’s also covered areas of various sizes on the three other sides of the ground. Definitely the best-looking ground that I have been too thus far. Then there’s the pitch – a fantastic looking 3G (or 4G – I never know the difference) surface that will no doubt come into its own during the long winter months. With the main stand already filling up, and with my two children today joined by the two children of our friends, we instead decide to take a spot on the opposite side of the ground where the kids will have space to burn off some energy should they feel the need. It turns out to be a good choice, but I’ll come to that in a bit. By 14:35, a small band of Burgess Hill fans, complete with drum, are already in full voice to our right. Throughout the game they more than do their bit to help create a cracking atmosphere. In fact, that the atmosphere is decent is probably the best thing that I can say about the majority of the game. Classic is not the word that springs to mind when recalling the action. From very early on it is apparent that the Hillians will be more than happy to take a point back up the road with them. At times the first-half (and indeed most of the second-half) looks more like an attack versus defence drill than it does an actual football match. Not that this is a criticism. Far from it. 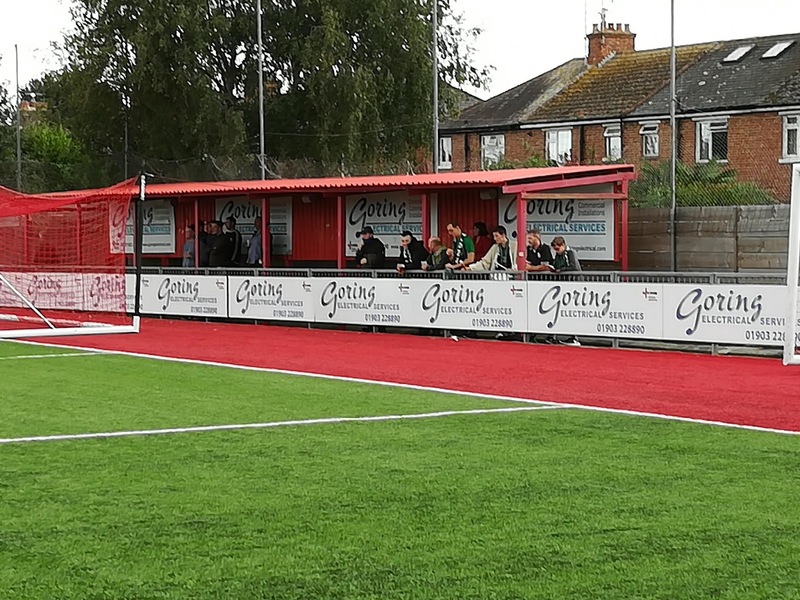 With Worthing boasting a perfect start to the season, and Burgess Hill smarting after a 6-1 drubbing at home on Saturday, keeping things tight is very much a priority. 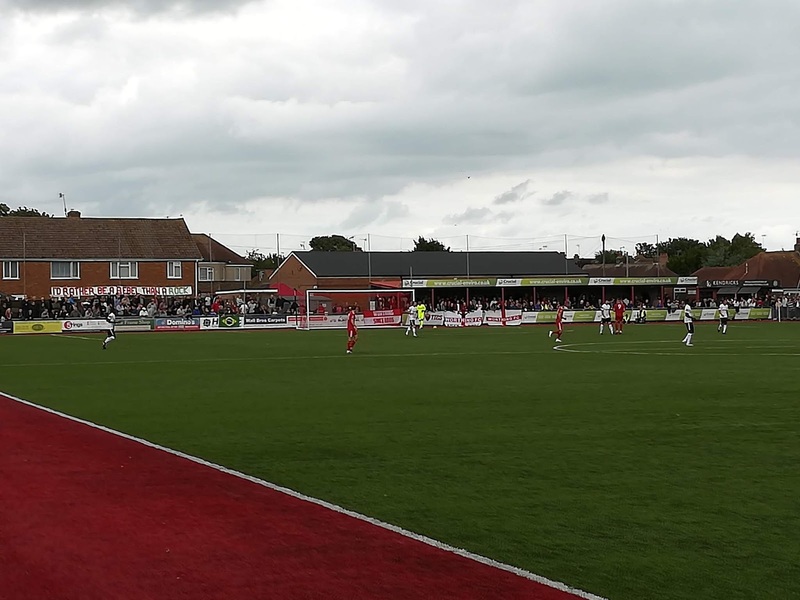 Throughout the first 45 minutes, Worthing huff and puff without creating too much in the way of clear-cut chances. Their best moments come from Jesse Starkey corners and through the skilful endeavour of my MOM David Ajiboye. The theme continues for much of the second-half, although Worthing do start to make more and more chances. However, resolute Burgess Hill defending keep the brilliantly nicknamed Mackerel Men out. As predicted, a lack of goalmouth action starts to see our younger companions’ attention start to waiver, and they’re soon finding other ways to entertain themselves. Not that they’re the only ones mind you. At one point I notice a young boy behind me sitting there reading a Harry Potter book. It’s without doubt more exciting – although an Alfie Jones book would surely be a better choice (not that I’m bias, of course). The game finally sparks into life in the last ten minutes as Worthing go all out for the goal that will keep alive their 100 per cent start to the season. More chances come and go. The bar is hit twice (one such effort, which can be seen above, follows a 1980s-style goalmouth scramble) and bodies of Hillian defenders (basically the whole team by this point) are flung at everything that moves inside the area. Then, there’s almost a late sting. With Worthing committing more and more men forward, the visitors break at lightning speed and work the ball to Kieron Pamment whose goal-bound shot is bravely charged down by Alex Parsons. Half-hearted shouts go up for a handball from the visiting fans behind the goal, but a penalty for that would have been extremely harsh, and they’re not overly surprised when their pleas are ignored by the man in black. So the game ends 0-0. My first blank of the season in my seventh game. Worthing will be wondering how it's finished that way; Burgess Hill will be delighted that their bus was well and truly parked for the majority of the 90-minutes. After the game, it’s great to see that children (and adults) are allowed onto the pitch for a kick-around; no grass to worry about damaging here. While out on the pitch watching the kids showing off their skills, I happen to bump into an old school friend and football teammate (hi Ollie if you’re reading this) who it turns out is now a regular match-goer at Worthing. Small world. My first month as a groundhopper, then, has now come to an end. It started with a 4-3 thriller and ended with a 0-0 er… well... not thriller. Who knows what the coming months will bring?